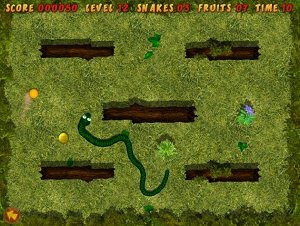 Snake Munch - The spinning twist on the classic arcade game! Afraid of snakes? Change your mind now and try this game! Navigate the snake by rotating it clockwise or counter-clockwise. Finally snake crawls around every corner! (Watch your back though!) Avoid the obstacles and eat all the fruits to advance through the levels. The more food the snake eats the longer it becomes so... Do not bite your tail off! Still not enough challenge? Create your own levels using the built-in easy-to-use level editor!